What Fun! 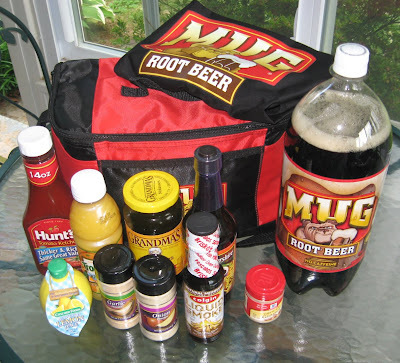 Mug Root Beer has donated barbecue baskets (well - coolers actually) for five Grill Girl fans in celebration of Father's Day. 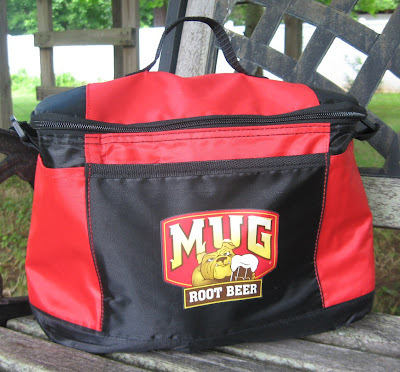 The Mug Root Beer gift packs are bundled in a neat, soft-sided cooler with the company logo on the side - the MRB bull dog. All the fixings to make a delicious, homemade barbecue sauce are in the cooler along with the secret recipe. OK. The recipe isn't really a secret. You can find the barbecue sauce at the Mug Root Beer page, but then you have to go to the grocery store and buy all the ingredients. If you win, the cooler and supplies arrive right at your front door. Can't beat that. The Father's Day barbecue contest is really simple. Just post a comment telling everyone why your Dad (or another dad-person in your life) is one hot griller (or not). Comments are moderated (to avoid spam), so don't sweat it if you don't see your entry pop up immediately. I'd have to be online and looking at that the very instant you posted (and then click as well) to have the entry come up on the spot. Also, remember to let me know how to get in touch. I can contact you at your blog or site if you have a contact form, or post an email, and I'll shoot you a note if the home guys draw your entry. Really, don't forget to give me some clue as to how to get in touch! If you aren't comfortable doing that, then you can email me at cyndiallison@gmail.com I'll put you in and have some way of getting in touch to get a mailing address. Don't worry about me using or sharing your information (other than for the mailing of the prizes). I'm just a girl with a grill(s), and I don't even have a mailing list. If I did, I wouldn't put anyone on there without permission anyway. Not cool - that. If you want site updates, there's a place to sign up on the right side - both an email option and various site feeds. But, that's on your end - not mine. This will be a low tech drawing. I'll write down each entry. My sons will fold and shake them in a bucket. Their Dad will draw the 5 winners. I would have my Dad draw, but he is no longer with us. He was a great griller though, and he got me started grilling. I'll take entries through midnight June 20, 2009 EST and then do the drawing on Father's Day. 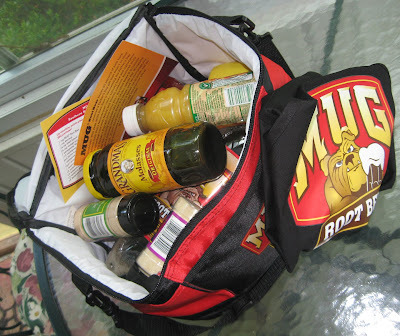 You can surprise your Dad or invite him over and make up a tasty barbecue sauce with the kit. Your call and fun either way. And the winners are in! Thanks to everyone for such great stories. You're all terrific. Here are the prize package winners pulled on the Mug Root Beer Contest. Congratulations and let me know how you like the sauce. I nominate my Dad, Joel Leonard as the best father griller. He is always experimenting with new approaches and ingredients. He even has a blog about his own burger. So he takes it serious. He also loves to teach others how to cook. He taught me how to cook scramble eggs when I was only 3 years old. Now I can cook all kind of stuff. Bet with that kit Dad could figure out new things to cook. My hero on the grill is Chef George Hirsch. Years ago he had a show on public tv. With an old CharBroil propane BBQ, with a custom made cast iron grill, would show folks how to grill meats, fruits and vegetables. No fancy equipment like they get to use today. The thing about him is, that he would explain everything he was doing on the grill so that you understood what he was doing and you learned something. I have never seen a better griller. My cute, chubby hubby (and great dad to our son) is an AWESOME griller. He comes up with his own BBQ sauces and rubs often. We can't wait to taste what he creates on the grill. He uses interesting ingredients that most people would never even think of! Good for us! My dad was a great griller in his day. At 92, he just supervises my brother who is a pretty fine griller himself as is his son in law. Grilling is a family tradition around here. I remember my dad grilling tomatoes when my mother was in the hospital having my brother. That would have been over 60 years ago. His grill was homemade, of course, but served us well until we both went off to college. Dad rarely cooked inside. Whenever Mom started working, I think we were all in trouble. We kids learned that if we put a big can of Ravioli on the kitchen table for supper that we would get a trip to Blue Bay, a seafood restaurant that was near our home. But weekends and holidays and special occasions called for grilling. Dad cooked steaks, hot dogs, hamburgers, and even fish on occasion. I think Dad's personality was especially well-suited to grilling because he was so patient. He was always level-headed and I almost never saw him lose his temper, even though I'm sure I tried his nerves on a regular basis. He seemed to have a knack for grilling the food for just the right amount of time. I wish I had learned more about grilling, but my sis is a great griller and I'm hoping that some of the grilling genes will rub off on me some day! Great to see all of the enthusiastic nominations. So I would be remiss if I did not nominate my dueling griller Lorin, whose child is only 4, whose name is Baker and sure be a future master cook, can't type to nominate his Dad yet. So please add Lorin Leonard, the best tenderloin griller that I know to the nominees. I guess my "grilling dad hero" for the weekend would be one of my longest-term friends (~35 years) Reggie Smyre ... This father's day weekend he drove all the way down to NC from PA to attend his daughter's high school graduation, and at the large family cookout afterwards (100+ people) the cook didn't show up, so he volunteered to do all the cooking ... this involved burgers & dogs, deep-fried fish, and shish-kabobs (with his own special sauce), grilled veggies & sweet potatoes, etc. He had 2 grills going, and a kettle of oil to deep fry the fish - he went through two bottles of gas! My Dad is the bestest griller ever!!! ;o) He taught most of what I know.. and everything else came from this website! WOOO HOOO..
My husband is getting to be a better griller. He had a major fear of grilling steaks but through a little pushing (okay, a big shove) from me and from Cyndi's site he's really starting to get the hang of it. Next we're going to teach him how to grill corn - this is very exciting!!! This is a cool drawing, Cyndi! I'm the griller, smoker, and culinary experimenter around my house. But I owe it all first to the influence of my grandfather who was an Army cook in WWI, and a Texas cafe owner afterwards. awesome idea for a contest. chef matt sent me. anways, i normally wouldn't consider nominating myself as the best griller. but boy do my kids do. there is nothing in the world ( next to taking them fishing) that my 4 boys, 9, 4(twins), and 2 love more than when dad (me) fires up the grill. they love the way i make them burgers and hotdogs in all different ways. mom even gets in on the action when i make her favorite chicken. tendy, juicy, and with the right spices. so thanks for coming up with this contest. thanks for letting me share my story. I nominate my husband, Brad Gold, a my griller extraordinaire. He has practiced more than 25 years to get "medium rare" down to a science. He's also great at multi-tasking on the grill -- steaks in one area, chicken in another, and veggie kabos there too. He's been known to stand out in a thunderstorm to finish grilling our supper and is adept at gas and charcoal. I nominate my man for the Father's Day Barbecue Contest! I nominate my oldest son, Jonathan. After my good fortune to participate in the Weber TV ad campaign, they left the new weber gas grill that was used for filming. That was in addition to the new Weber grill of my choice per the original agreement with Weber. So, I gave him that "once used" grill. He was delighted and began to expand/extend his repertoire beyond just grilling steaks and burgers. I had taught him the basics of high heat searing and the art of judging the various degrees beyond rare through well-done. That was the easy part. He uses marinades and dry rubs well beyond hiw dad's experience level. He has the creativity to experiment and has hit some home runs. One was a dry rub mixture of salt, pepper, paprika, fennel and garlic. Another was marinating beef tri tip overnight in Italian Dressing spiced up with Coleman's Dry Mustard! So I am proud to say that he is not just a "chip off the old block," but has gone beyond his dad in the use of the grill. Thanks for the opportunity to appear on your site! I nominate my late son who followed in my foot steps in the fire service in which I was the head grill er at the fire hall,as grilling was a big part of his life as the fire service was, he went to town every Friday night to get something to take to the fire hall and grill, always coming out of his pocket,I was told he always bought and wouldn't let anybody pay,he loved to grill for others, if he should win ,I will except on his behalf and donate the prize to his memorial fire school for a door prize to be given away to some firefighter on Nov.7, that will be my fathers day present knowing that he is still doing what he loved and that is giving to others. My dad does a few things really well on the grill - salmon, steaks, and veggies. Last night he grilled some thick and tasty pork chops and asparagus, though, so I'll add chops to the list. He's not one of these macho dads at the grill, he just likes the ease and flavor of grilled food. Now we enjoy cooking together. He does not know how to boil water or wash dishes, or does he care to learn. He can't prep the food for the grill, he can't clean the grill, and half the time he has problems starting the fire on our old charcoal grill. But if I get everything ready, cleaning the grill, purchasing and prepping the foods, marinating the meat, making the fire, and then telling him your grill is ready! Then he is right there ready to flip some meat and vegetables, he's real good at that. He is great at what he wants to be great at that, and thats enough for me. She is totally dedicated to grilling and outdoor cooking! She is passionate about the subject and, therefore, deserves the recognition for her ongoing efforts in this field. And based on the work she does here and elsewhere on the Internet, it is very apparent that SHE KNOWS BBQ AND GRILLING! I nominate myself because I grill almost every meal, blog about grilling, shoot videos about grilling, and have won some awards grilling. I am nominating my dad. Unfortunately, he spends so much time mowing lawns these days that he doesn't have much time to grill--this would give him the incentive! 'One hot griller'.?? I guess I would have to nominate myself. Just recently got in roasting stuffed peppers on the grill. Various types of fish have also been some recent adventures on the grill. Of course, I am pretty old-fashioned and can 'stomach' any well prepared streak, burger, or brat off the grill. Great contest, glad to see you are getting some positive feedback/results on it..!! I wouldn't usually do it but this is a really cool gift so I nominate me. I love to grill and I cook on mine year round. My son enjoys it as well because he gets to play outside while I cook. Matthew is enjoying helping bake and cook this summer because he thinks all the measuring and mixing is like a science lab! We are having a great time creating new recipes. This would be a great for a single mother on Fathers Day, free fits right into my budget! My dad is no longer with me either :( but I have some wonderful memories. My hubby is a great BBQ chef-we usually have Carne Asada and lots of other spicy meats on the grill when friends visit and everyone compliments him on his great cooking. (believe me he loves it!) I really like root beer and have never seen this recipe before-even if I don't win the goodies to make it, I would love to try it out anyways! Wishing your hubby a great Father's Day! I'd nominate my son Buck for the Hot griller! He's a father of 3, weighs 240, stands 6'3" and is a pussycat- except when grilling! Stand back and drool he says! LOL He likes doing roasts on indirect heat for hours...and the smell is amazing. His fav is a garlic/butter rub that he came up with (can't share the recipe cause he won't)! He also says kabobs are for sissys...but he makes them just to get the kids to eat veggies! Dang I'm tickled I raised a great griller! Now all I have to do is the corn on the cob! WooHoo! My father is no longer here, so I have to nominate myself. I am a beginning griller, having recently bought two grills, one gas and one charcoal. I intend to do as much grilling as as many different things as I can. Right now I've tried pork, shrimp and beef, doing a beef tenderloin over indirect heat that tasted wonderful! I look forward to many years with my grills. and I thank him for being the great dad he was. Happy fathers day all. I nominate my dad, Lenny. He's too elderly and sick to grill anymore so my DH does all the grilling. But my dad could grill the meanest steak on the block when I was a kid. He'd grill these monster sized porterhouse steaks that were super tender and had the BEST seasoning ever. So I nominate him :) Thanks, Cyndi! My dad got me started on the grill. When ever I grill, I remember him and those times we spent together in the backyard. All of the entries are just fabulous. Thank you so much for sharing these stories. I enjoyed every one. The boys' Dad drew the names, and I have sent the emails out. Congratulations to the five pulled from the bucket (actually Tupperware bowl). I'll post the winners here in a few minutes. Good Afternoon!!! barbequemaster.blogspot.com is one of the most excellent informational websites of its kind. I take advantage of reading it every day. barbequemaster.blogspot.com rocks! The author of barbequemaster.blogspot.com has written an excellent article. You have made your point and there is not much to argue about. It is like the following universal truth that you can not argue with: A Gillette is better than Ockham's razor Thanks for the info.